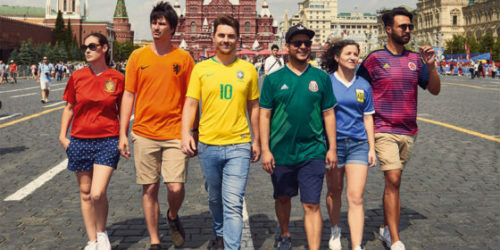 When Columbian activist Mateo Fernandez left for Moscow, he knew he was about to do something dangerous during the World Cup. Fernandez joined six other activists from around the world to quietly subvert Russia’s “gay propaganda” law that prohibits public declarations of LGBT pride. The group quickly donned team shirts for their native countries and walked around the city taking pictures. When they stood together, they formed a “rainbow flag,” hiding it from authorities in plain site. Before leaving, they agreed that if authorities stopped them, they would say they were just friends from different countries touring Russia together. The pictures quickly went viral, but Fernandez was stopped at the airport as he attempted to leave the country and interrogated for 15 hours. His phone and luggage were confiscated and he was kept alone in a small white room until he was released according to Gay Star News. “They never told me why I was detained. They demanded to know why I was here. Over and over they asked. It was nerve-wracking.,” Fernandez told the outlet. When authorities asked if he was in the country for the World Cup, he stuck to the story about being a tourist. Eventually Fernandez was released without any explanation why he was held. None of the other activists were stopped on their way home. 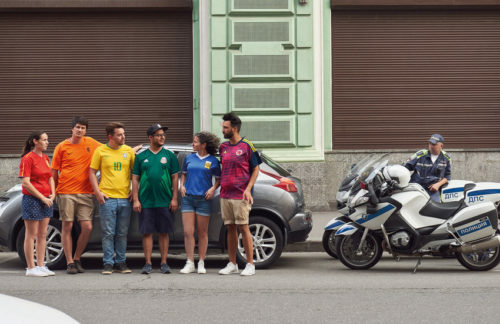 These brave activists created a pride flag with their t-shirt and then set off across Moscow taking pictures.